Has Lennon Gallagher Mocked His Cousin Anaïs On Twitter? Relations between the children of Liam and Noel Gallagher seem to be more strained than ever. 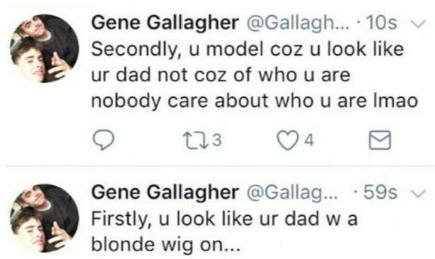 The Gallagher family seem to be at it again, with Liam Gallagher's eldest son now taking aim at Noel Gallagher's only daughter. Anaïs, 17, confessed to feeling "fragile" in a tweet, writing: "I need love today. I'm feeling super fragile and basically need a boyfriend. But keep reminding myself I'm too embarrassing to get one!" However, her 18 year-old cousin and fellow model simply replied: "Really?" The latest slight comes just a week after his younger half-brother Gene slammed Anaïs in a now deleted tweet, saying she looked like her father Noel in a "blonde wig". What's most shocking is that Gene's tirade came after he posed for a snap with his cousin just two weeks before. Anaïs took to Instagram to share the post alongside the caption: "Big up that fam love". While it's unclear what's transpired between the pair n such a short space of time or if Lennon is really mocking his cousin, it's definitely not doing anything for their fathers' hopes of reconciliation. Just as well that the Oasis brothers are busy with their own solo careers, with Liam set to release his debut solo album on 6 October, and Noel announcing the details of his third studio album, Who Built The Moon?, and its accompanying tour this week. While fans were impressed with his new sound, his brother had a lot to say about Noel's comeback, writing on Twitter: "Psychedelic music by a beige drip is like a vegetarian trying to sell you a kebab as you were LG x"
Then referring to Paul Welller and Johnny Marr - who are both credited as contributors on Noel's new album - he added: "It takes more than wheeling out your old mate uri geller and har mar superstar to make a so called out there record snoozer as you were LG". Noel Gallagher headlinedWe Are Manchester on Saturday (9 September), which saw the Manchester Arena re-open its doors following May's horrific terror attack. While the Ballad Of The Mighty I singer appeared to get emotional during his rendition of Don't Look Back In Anger, he later revealed exclusively to Radio X that he wasn't actually crying.